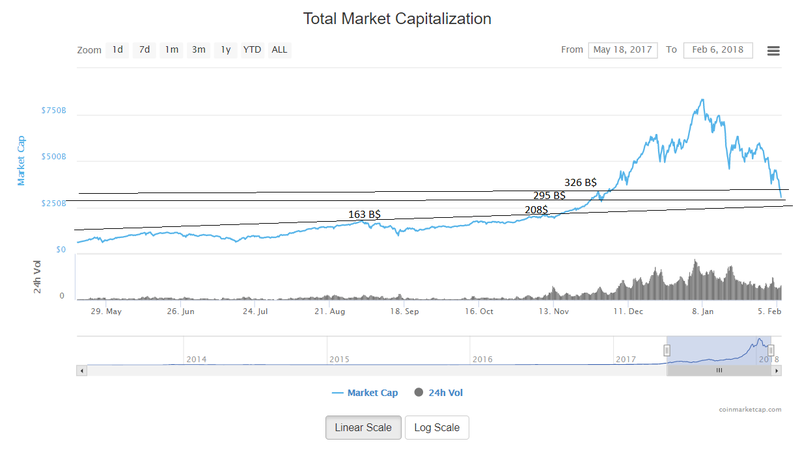 Breaking Rock Bottom Levels of the Total Market Cap will its reach the Bottom of every bottom? 150 Billion $? In my last post I already mentioned, that triple bottom os not a good sign. markets may hit lower and we can expect a bloodbath, but its best time to buy very slowly, start investing with 10% of the amount you are planning to invest, go slow. Fortunately its working. As for shopping cryptos, i am seeing this "Blood Bath" in the market, and many thinking that its the end of crypto. Well thats good news for me, as this is one of the best times to invest. Why? Jst compare the prices of the TOP 10 cryptos to a year back, they are still 100z of percentage above those levels. I see 100z of post that confuse you by writing long posts, and at the end you remain still confused. well i keep it short and simple. Also some show you crazy chart levels with 10 different drawings etc. on them. Well ill never do that. All my posts on levels and cryptos are to the point, and the decisions i make with my own money. Yes i did sell in Jan first week giving proof and yes, i did buy now and i am still a buyer and buying at lower levels. Im no god that ill catch the bottom, but im sure ill make 2 to 10 times from these levels if i hold. "I'M NOT A TRADER, I'M AN INVESTOR". I work by listening to people instead of arguing and giving my opinions and looking at the charts to see the large levels to buy in or sell out. These are just my predictions, and not advise. However i follow my own research and analysis. well said. loved your words because what you said is so true. no one can predict the exact bottom but from this level for sure 2x-10x. last year January eth at 8$ now still above 500$ that is too much. I feel pity for the people who say it is an end. I say " it is a huge buying opportunity ".